For more than 40 years, Utah Scientific broadcast video routers and related gear have brought new levels of signal flexibility, modularity, and signal-processing power to major networks and small public stations worldwide. Just ask our customers – they’ll rave about the outstanding results they get with our routing switchers and signal distribution equipment and the fact that we stand behind these products with a free 10-year warranty and 24/7 service support. We address the complex signal-processing challenges of today’s broadcasters by providing a single platform for all signal formats, including those found in IP networks. 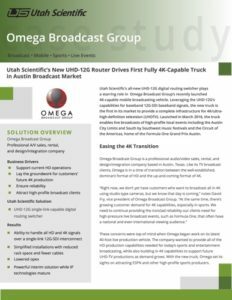 Utah Scientific’s all-new UHD-12G digital routing switcher plays a starring role in Omega Broadcast Group’s recently launched 4K capable mobile broadcasting vehicle. Leveraging the UHD-12G’s capabilities for baseband 12G-SDI baseband signals, the new truck is the first in its market to provide a complete infrastructure for 4K/ulta-high definition television (UHDTV).